Established in 1998, Indicator Birding is a Pretoria Based birding tour operator, specialising in Eastern South Africa, and particularly in the diversity rich areas of Gauteng and neighbouring North-west, Limpopo and Mpumalanga Provinces. This area is ideal for short visits, or as part of a longer tour, and offers a host of regional endemics and specials. Founder and owner, Etienne Marais, has 30 years of experience birding the region, and is an adventurous birder, and keen power-birder. The BBD team he established with Pete Irons in 1999 has often been the team to beat in South Africa's national Birding Big Day event. More recently with Faansie Peacock, Rob Geddes and Richard Montinaro, "The Raiders" became the first team to beat 300 species in 24 hours. 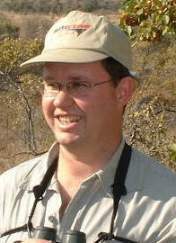 Former council member of BirdLife South Africa, and active birder for over thirty years experience, Etienne Marais knows the birds of Eastern South Africa intimately. He has led numerous tours across the region and also to Tanzania. Past Chairman of the Pretoria Bird Club, Etienne is a popular leader of club outings due to his ability to show people good birds, and get help birders get good views. When not birding, Etienne is involved in eco-tourism consulting and digital promotion. He is married to Alice and has two children, living in Centurion, Pretoria. We have masses of overwhelmingly positive feedback from satisfied clients, some of which can be viewed on our Feedback page here. However you may want to check directly with them. Rather than posting client contact details on our web-site, (where it can be harvested by unscrupulous spammers) we will send a sample of feedback and contact details of clients to bona fide potential clients. You will be sent this information when you make a tour/guiding enquiry.